Banana tree offers you a lot of health benefits. Almost all parts of banana tree can be used. The fruit of banana is particularly very beneficial. We all eat it almost daily. Other parts are also very important. Banana flowers are used as a vegetable by the South Asians as well as the Southeast Asians. They use it in the raw form or steamed with dips. They also add banana flowers to soups, curries and fried foods. The flavour of banana flowers is like that of artichoke. You can eat the fleshy part of the bracts and the heart of banana flower. According to the African Journal of Biotechnology, 100 gm of banana flower can offer you the following nutrition. Banana flowers are pretty looking and they are often called banana hearts. Other than being decorative they are also very important for us as they are full of nutrients and very beneficial for our health. 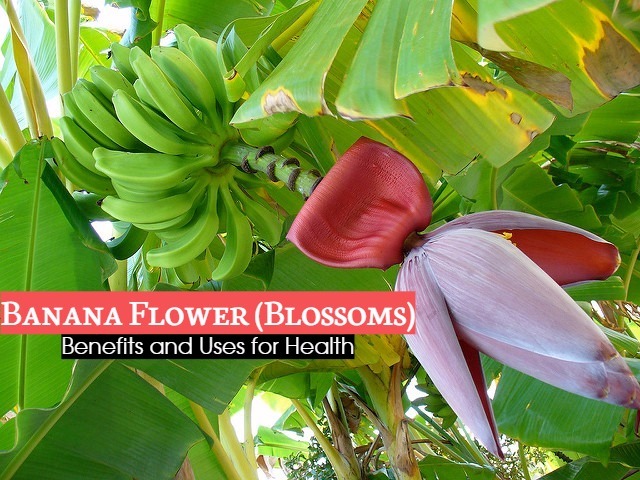 Given below are some of the benefits of banana flowers. If you are feeling down, don’t go for anti-depressants. All you need to do is to include banana flowers in your diet. This can helps in lifting your mood. This is because banana flowers contain magnesium, which is effective for reducing anxiety and boosting your mood. So, banana flowers are natural antidepressants and have no side effects at all. New mothers may face a lot of problems when they breast feed their new born babies. One of the major problems faced is the reduced supply of milk. By consuming banana flowers the supply of milk can b increased. As a result the new mothers can feed their babies better. Banana flowers are rich sources of soluble and insoluble fibre. Soluble fibre helps in the smooth passage of food through the digestive tract as it dissolves in water and forms a gel. Insoluble fibre adds to the bulk of undigested food as they are not dissolved in water. Both these fibres help in proper digestion and absorption of food. Banana flowers can help in preventing uterus problems. To have a healthy uterus, consume banana flowers to which are added turmeric powder, peppercorns and cumin seeds. Boil banana flowers with minor peppercorns and cumin seeds. Add ¼ teaspoon of turmeric powder and salt also. Drinking this decoction can help in getting rid of uterus problems. By taking in banana flowers in specific amounts, you can reduce the levels of blood sugar in the body and also increase the total haemoglobin level in the body. However, the hypoglycaemic effects of banana flowers have not been proved clinically. Free radicals can cause Alzheimer’s and Parkinson’s disease. Eating banana flowers regularly can prevent these diseases. Free radicals in the body can greatly harm your health and cause various problems. The extracts of methanol present in banana flowers is known for its antioxidant properties. These flowers are great for dealing with the free radicals that often cause damage to the body. It cans treat various health problems such as premature aging, cancer and so on. You can make full use of the antioxidant property of banana flowers by including them in health supplements. Women often experience great pain during menstruation. Some suffer from severe PMS symptoms, while others experience excessive bleeding. You can get relief from such problems by having a cup of boiled banana flowers. Cook banana flowers and have it along with curd or yogurt. This helps in increasing the progesterone hormone in the body, thereby reducing the bleeding. Banana flowers are rich in various vitamins like Vitamin A, C, and E. Potassium and fibre are also found in these flowers. All these help in making banana flowers excellent health food. It provides you lots of health nutrients. You can treat infections with banana flowers. This is because of their ethanol based extracts. Banana flower has the power to inhibit the growth of pathogenic bacteria. Some of the pathogenic bacteria are Bacillus subtalis, Bacillus cereus and Escherichia coli. Banana flowers also have the power to heal wounds. Studies also say that banana flower extracts can inhibit the growth of malarial parasite plasmodium falciparum in vitro. But these claims have not yet been proved completely. So, these are some of the benefits of banana flowers. Consuming banana flowers along with bananas can enhance the health benefits. How to Select Banana Flowers? Select banana flowers that are fresh and firm. See that there are no cuts or blemishes on the flower. They should be smooth and bright in appearance. The overlapping of outer leaves should be tight. How to Store Banana Flower? Use fresh banana flowers. Wrap it in transparent plastic, cover in zip lock bags and store it in the refrigerator. You can just chop these flowers and add it to salads. It is also used in soups. In India and other Asian countries sliced banana flower is added to meat, stews, stir-fries, rice and soups.